What's behind Caterpillar's New Hybrid Microgrid Play? Caterpillar became the latest big infrastructure company to unveil a microgrid play with the recent launch of its hybrid microgrid into the global market. The Cat hybrid technology combines solar, energy storage and fossil fuels and will focus on projects 10 kW to 100 MW. A $47 billion company, Cat intends to leverage its global distribution network and focus on emerging markets, where renewable energy projects appear to be yielding higher returns than in North America and Europe. Cat follows several other big international players into the microgrid market, among them ABB, Hitachi, Schneider Electric and Siemens. Working with First Solar and Fluidic Energy, Cat is offering a hybrid microgrid that uses thin-film solar, advanced monitoring and control systems, Caterpillar diesel and natural gas generators, and energy storage devices such as ultracapactors and lithium-ion batteries. Areas with strong sunlight and little or no access to electricity are Cat’s main market. They include Africa, Indonesia, South America, Australia, New Zealand, India and the Pacific islands, Johnston said. The market segments include islands, remote mining sites, remote villages and military operations. The biggest challenge to reaching these markets is providing a standardized system that’s cost-effective. In addition, financing is a challenge, said Johnston. “Many customers don’t have the ability to pay large capital up-front expenditures,” he said. Financing for projects is expected to come from a number of sources, including Caterpillar’s financial arm, project developers, local governments and large financial institutions, said Johnston. Caterpillar’s first hybrid microgrid project will be in Indonesia, according to the company. The project will help the government accelerate electrification. In the project, the Caterpillar technology will provide solar PV distributed to 500 islands, said Johnston. “Renewables provide the opportunity to bring electric power to people who never had it before,” Johnston said. “The percent of renewables varies, but we can reduce fuel use by 10 percent incorporating solar, up to one-third when we add energy storage and we can go up to two-thirds energy replacement with time shifting. And sometimes we can do 100 percent with renewables.” Time shifting involves storing renewable energy during the day and releasing it at night for use by the customer. Some of the remote villages would prefer to use no diesel fuel at all, he added. Caterpillar is now bidding projects with 100 percent solar plus energy storage. Thin-film PV technology from First Solar is incorporated into the microgrids, and bears the Caterpillar brand, Johnston said. The energy storage systems available include a high-cycle-life zinc-air battery system from Fluidic Energy. The different systems are combined in standardized packages. “Our goal is to standardize to reduce costs, improve reliability and support systems through our dealer network for the 20-plus years the systems will operate,” said Johnston. The company has tested its system at its Tucson Proving Ground in Arizona. In March, Caterpillar installed 500 kW of photovoltaic solar power along with 500 kW of short-term energy storage in the form of batteries and ultracapacitors. This supplements power that had been provided by three C15 410-kW diesel generator sets. ” The integrated system is expected to reduce fuel consumption by approximately 33 percent,” said a company press release. 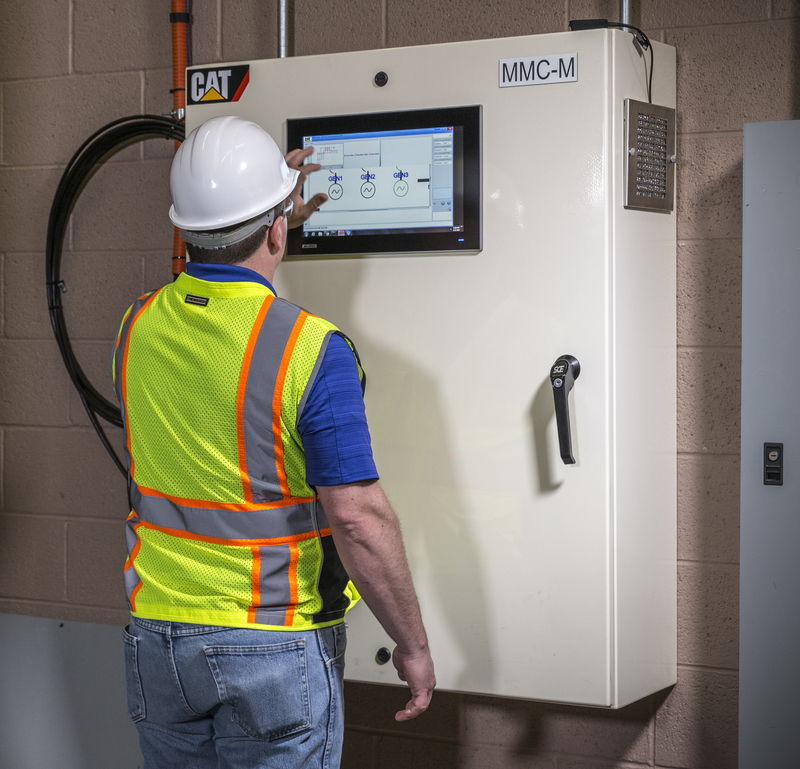 One of the newest systems included in the microgrid packages is the Cat Microgrid Master Controller, which monitors and optimizes power usage in the microgrid. The microgrids’ generator sets, PV systems and energy storage systems have their own controllers. “The Microgrid Master Controller sits above all these and does system-level dispatch and monitoring,” said Johnston. Caterpiller has also partnered with Powerhive, which provides clean electricity to people in emerging markets, offering services ranging from site analysis to the sale of electricity. “Powerhive is a neat company that provides services at several points in the value chain,” said Johnston. Powerhive’s satellite imagery system identifies the layout of a village and estimates the electric loads if the village has electricity. This task is automated using image analysis, Johnston said. In addition, the company will install a distribution network and transmission and distribution within villages. Powerhive can also help pull together financing for a project and install entire systems. Powerhive’s offerings include a distribution system monitoring program. The company can control electricity flow to any customer–generally a home in a village. “They use a mobile payment system where customers can pay ahead and Powerhive remotely turns on electricity to that home. They tell the customer how much they have left remaining in that account and can control the flow that way,” said Johnston. For the Indonesia project, Caterpillar identified the optimal system design using a NASA database for global solar irradiation data, according to a Caterpillar white paper about the project. It evaluated a site with a 670-kW solar PV system distributed over a number of rooftops. The company looked at options that included–and didn’t include–energy storage, the white paper says. The system includes 2,316 solar modules and the racking structure needed to roof-mount the panels in various locations, says the white paper. “The energy storage system consists of one Cat BDP250 bidirectional energy storage inverter and two strings of batteries. The inverter interacts with the power system frequency and voltage to add power when it is needed to compensate for energy fluctuations. The grid stabilization effect of integrating energy storage helps the overall power plant maintain system frequency,” the white paper says. Emerging markets with little or no infrastructure in some ways are ideal for the microgrid system because they avert the need for expensive and inefficient transmission and distribution systems, Johnston said. “It does allow us to put generation closer to the load so there are fewer losses and there’s no need to build expensive transmission and distribution networks that are typical with the central generation model we have developed in much of the world today,” he said. Track the growing use of hybrid microgrids in emerging markets. 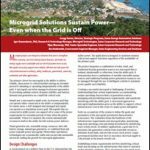 Subscribe to Microgrid Knowledge’s free newsletter. Do you have a brochure that you can share with me, please?